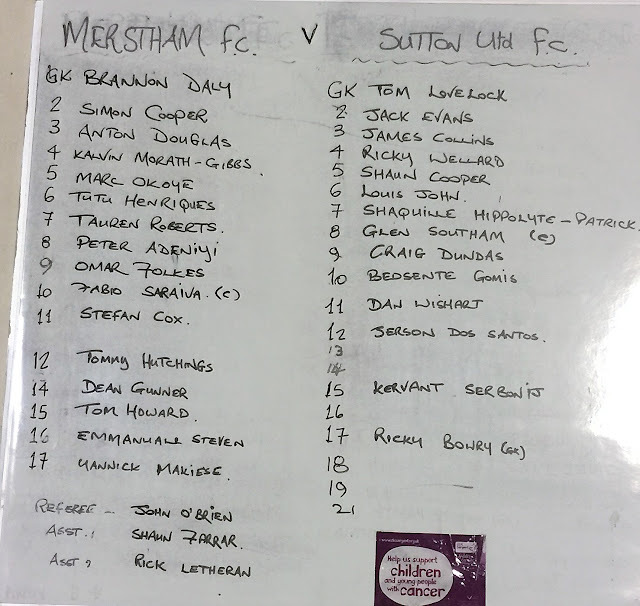 MERSTHAM FC was founded in 1892 and played in local leagues before joining the Combined Counties League in 1984. 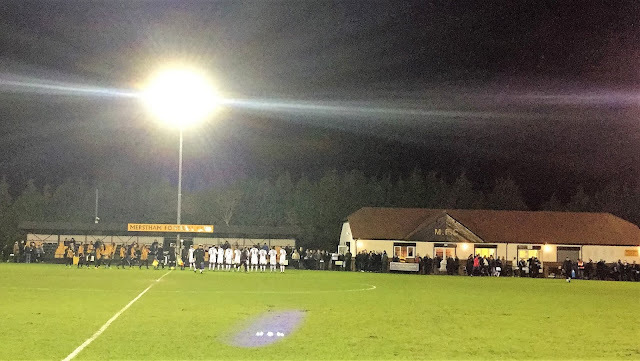 They remained in its top division for the duration of their stay, finishing runners up on 4 occasions before winning promotion to the Isthmian D1 South in 2008. 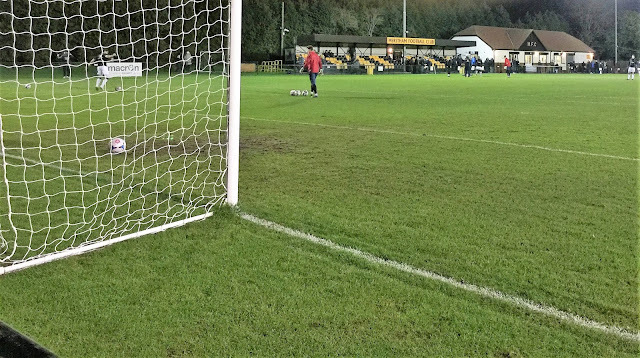 Since then they have had a best-ever finish of 7th last season, and currently, sit 3rd in the table before Saturday's game at home to 4th placed Folkestone Invicta. In the FA Cup, their best ever run came in 2008 when they reached the 3rd Qualifying Round before going out to AFC Hornchurch. Earlier that year they had reached the FA Vase Quarter Final before bowing out to Needham Market. The FA Trophy 2nd Qualifying Round has been reached twice. 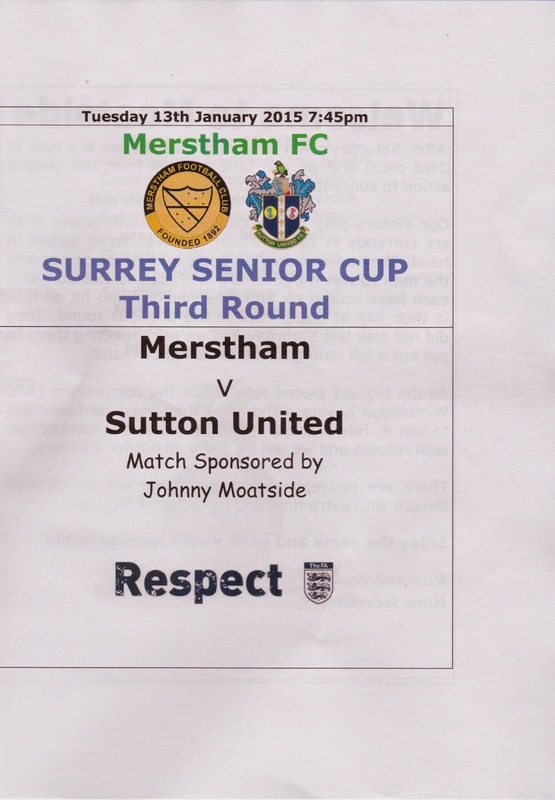 The club can list several local cups to its honours - most recently tonight's competition, the Surrey Senior Cup in 2008. I had seen them play once before - in August 2003 they ran AFC Wimbledon really close in a game played at Kingsmeadow, only losing 3-2 when most sides were copping right thrashings. It was once again time for a new ground for me and fellow groundhopper Anwar. We were hoping for something local and cheap and with that in mind, we picked Olney Town and Cogenhoe United, plus the slightly further away Highworth Town as it was one of the few that I needed to complete the Hellenic Premier. We did bear in mind however that we might have to alter plans due to weather, so I didn't bother starting my blog early like I normally do. I had a good weekend football wise with Wycombe triumphing 1-0 over York in a really good game. 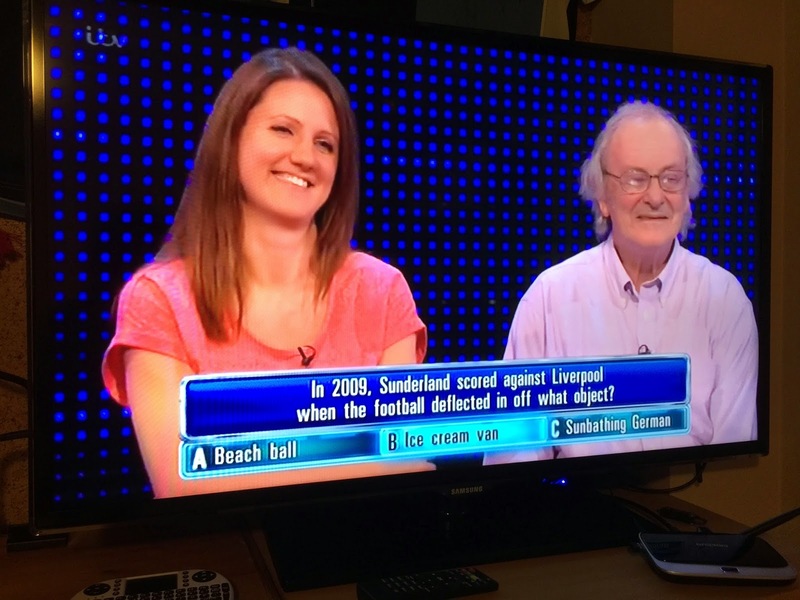 Apart from that the most notable incident of the start of the week was seeing this bafflingly stupid answer on 'The Chase' - I've not seen many Ice Cream Vans on the pitch, not even at non-league level. On the day of the game, we had drawn the shortlist for games down to 3 - those being Highworth Town, Olney Town and Cogenhoe United. However, one by one, the weather intervened and put paid to these. I had woken around 8 am and had a bath, and I spent the morning correcting some picture URL’s on my old blog where Facebook had changed the location of my photos. I only got around 10 done, and with nearly 200 to do, I am in for a long job. After my initial choice of games had gone, I spent the afternoon looking for alternatives, but they were few and far between. I decided to look again when I got to Anwar’s, leaving home at 3.15. I arrived to meet him in Aylesbury at 3.50 and after going to B&M bargains to get some drinks for the game, we took another look at the fixtures. We had it boiled down to 2 options - Carlton Town who were having a pitch inspection at the time and Gresley. We waited for the pitch inspection at Carlton, which it failed. As Gresley were not answering the phone or replying to tweets, we decided not to risk it. 2 games were confirmed on in roughly the same area and we chose Merstham v Sutton United over Horley Town. By now it was 4.30, so we got on our way. The M25 was dreadful as usual around Heathrow but apart from that, it was good going. We got to Merstham at 6 and decided to walk into town. Big mistake, the place was dead and the only food was a tenner a meal in a pub. With me hoping for a cheap night out, that wasn’t going to happen. We walked back to the ground, getting a Samosa from a newsagent on the way. As the programmes had not arrived yet, I went into the bar for a pint of Strongbow which was reasonable value at 2.80 a pint. We went into the ground at 7.15, paying £8 for entry and getting a free single sheet of paper for a programme. I got some pictures of inside the ground and I was pleased to see it was just as well kept as it was when I visited for pictures on a non-matchday, around 5 years ago. A friendly board member or groundsman (or possibly both) saw my Wycombe coat and wondered what I was doing at a random game. I told him I was a groundhopper and so he invited me into the smart boardroom for a look at the club. He was the same as lots of others at the club - really pleased to have someone new at the ground. After coming out of there, I met up with Anwar again, and we went to the tea bar. 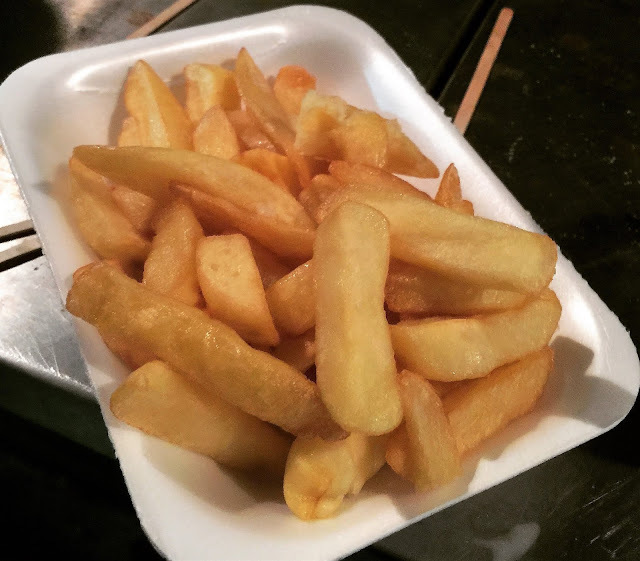 I got myself a portion of chips which were pretty good, and decent value for a quid. So much so that I had another portion during the first half. I also met the club mascot of sorts, a lovely dog called Charlie, who was happy to have a fuss made of him and pose for a picture. The game was a local derby of sorts and was quite a feisty one with plenty of meaty tackles flying in. They went largely unpunished, apart from one notable incident when Simon Cooper was sent off just before half time. By that point Merstham were ahead - 34 minutes in Fabio Saraiva's powerful free-kick deflected in off the post. The visitors had the better of the first half though and this was, even more, the case in the second half as they sought to use their man advantage. They had plenty of possession but were wasteful in the final third. They eventually got their equaliser through Shane Cooper's deflected shot from about 25 yards out. Sutton looked the most likely to score, but there was a sting in the tail. 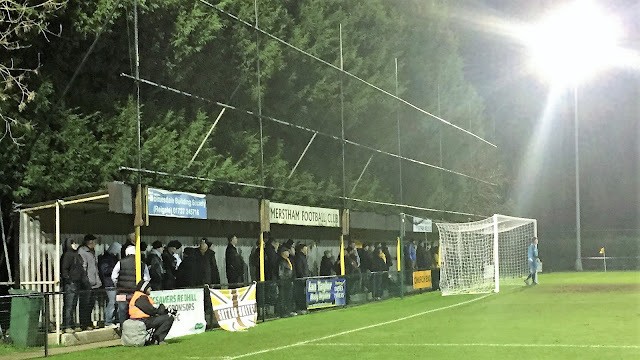 Right on time Tommy Hutchings netted a winner to preserve Merstham's 12-match unbeaten run and see them into the next round of the Surrey Senior Cup. The match finished pretty late, and it was around 9.50 when we left the ground. We had a good journey and despite a huge range of road closures and roadworks going on, none of them affected us that badly. We listened to the pulsating FA Cup game between West Ham and Everton, which the Hammers won on penalties. I dropped Anwar off at 11, getting home myself 20 minutes later. After watching TV I got to sleep about half midnight. When driving home, I noticed that one of my headlight bulbs had gone, which seems to happen with alarming regularity with my car. I used my fog lights as a temporary measure, replacing it the following day after I got home from work. 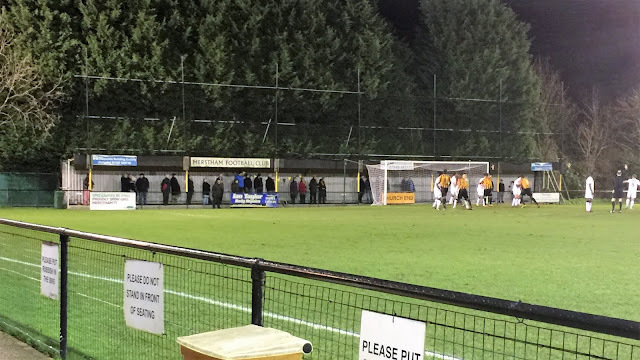 MOATSIDE is a smart ground for step 4 and has seen a lot of work in recent years to bring it up to standard. Though there are a few metal stands, they are all nicely done in club colours and aren't the bland carbon copies that you see at other grounds. On the side you come in on, there is a stand decked out in yellow and black seats holding around 200 fans under cover. There are areas of cover behind each goal, probably holding around 600. The overall ground capacity is 2000. There is a bar outside the ground which is nice to spend time in, with a reasonable range of drinks. The tea bar was good and the only option for food that I could find. There was a club shop, but it was closed on my visit. Overall I enjoyed my visit here, it's a nice ground and a friendly club.